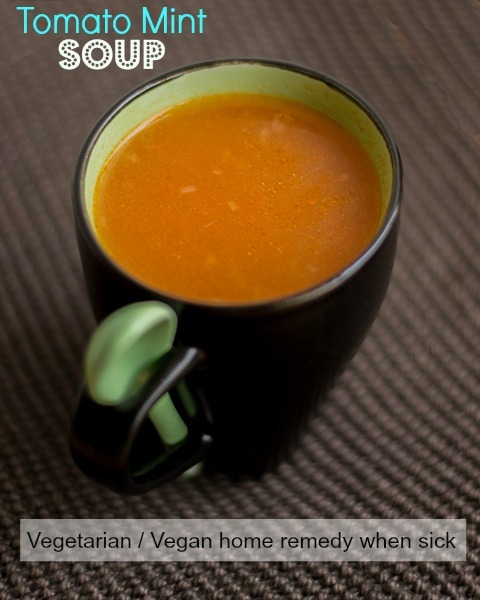 Easy Vegetarian recipe for Warm Tomato Mint Soup. Best home remedy when sick with cold, fever or headache. Also aids in digestion. This is my fathers secret tomato mint soup. Its a staple at my house. The mint leaves add so much warmth to the Tomato Mint Soup and it feels so light on the stomach. 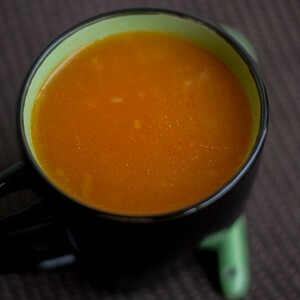 This is an excellent home remedy Tomato Mint Soup when you are sick. 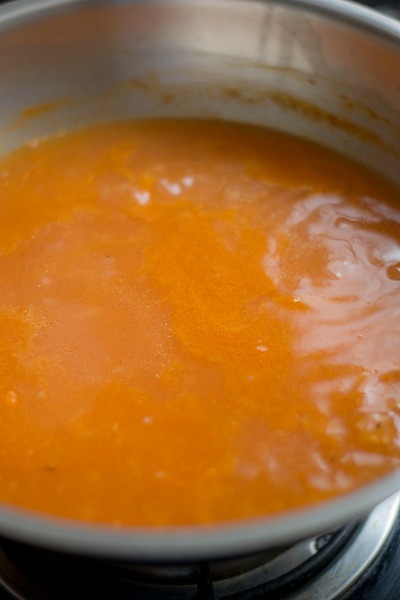 Tomato Mint Soup clears up the blocked nostrils in no time. The addition of mint also aids in digestion. I used to get super excited when I was young seeing this Tomato Mint Soup made. I was given the task of tying the mint leaves together with a cotton thread and then the mint was simmered in the soup along with the thread. Somehow it brought so much joy. The whole process was so much fun. 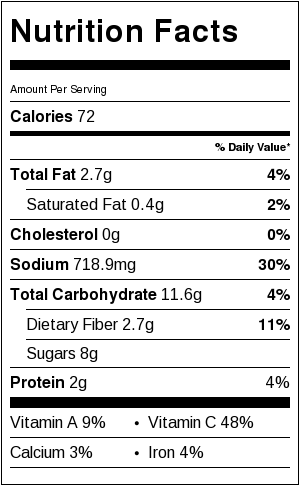 Today, this has become my sons favorite Tomato Mint Soup. 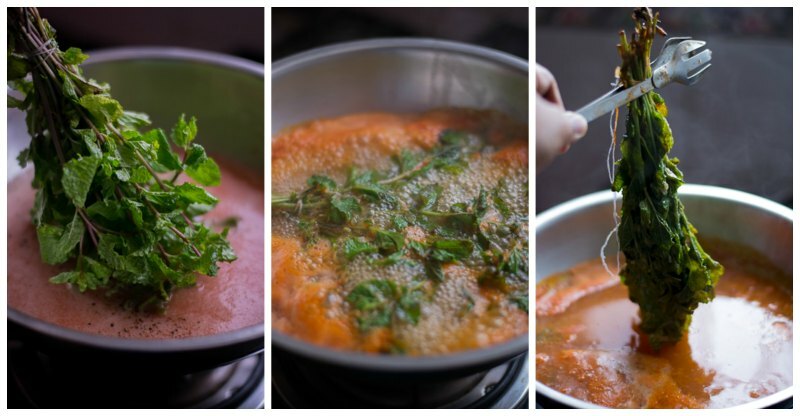 This Tomato Mint Soup has just 5 main ingredients plus seasoning. Here is how to do it. First, we need to blanch the tomatoes to remove the skin of the tomatoes. Boil water in a kettle and drop the tomatoes in boiling water. Let it boil for 5 minutes. Remove off heat. When cool enough to handle, peel the skin of the tomatoes. Run the peeled tomatoes in a blender to a puree. Strain the puree to get rid of the seeds. Set aside. 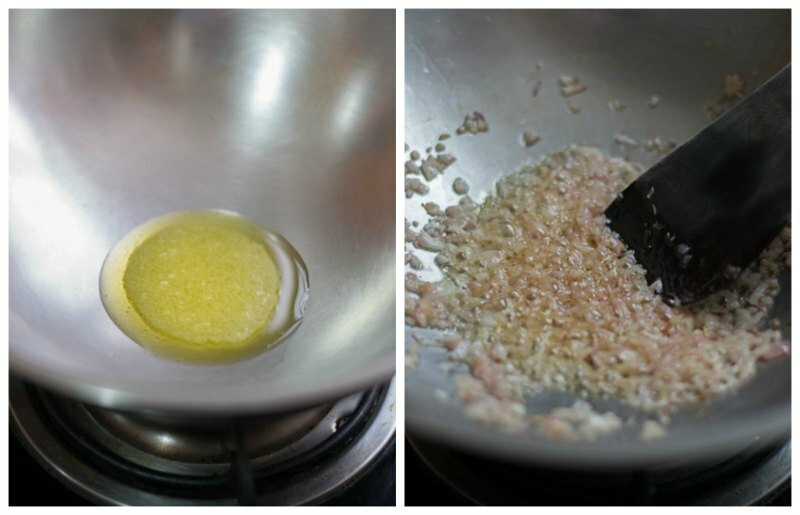 Heat a pan and add 2 teaspoons of ghee (you can use olive oil if you want it vegan). Add in the very finely chopped onions and fry till soft. 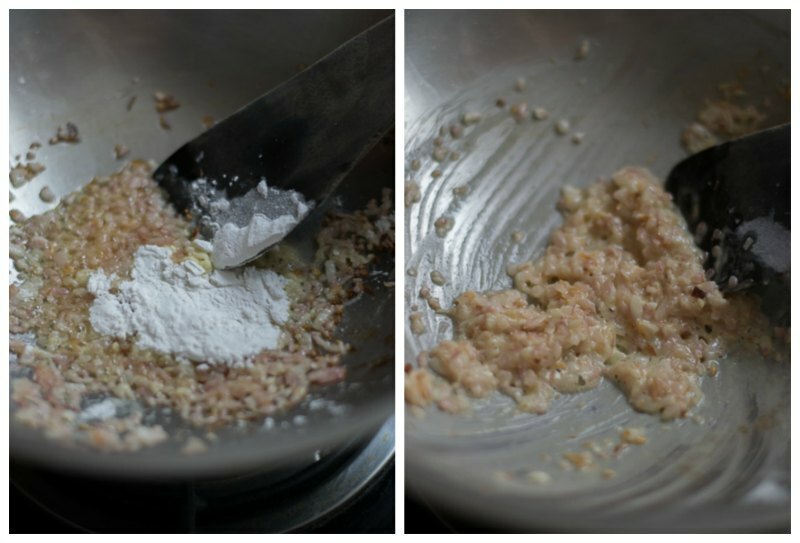 Once the onions are soft, add in the corn flour (corn starch) and fry for 10 seconds. Add in 1.5 cups (around 375-400 ml) of water and stir well. Add in the strained tomato puree. Add in the salt, pepper and a little sugar to taste. 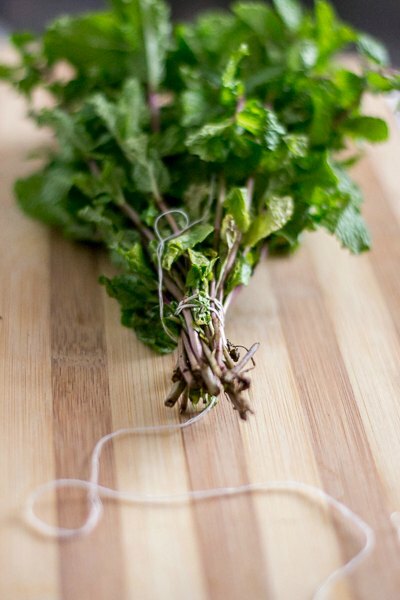 In the mean time take 15-18 mint stalks and tie it with a clean cotton thread. Add it to the soup and make sure the leaves are fully immersed. Let it boil for 10 minutes on medium flame. After 10 minutes, remove the mint stalks and try to squeeze all of the juices back on to the soup with the help of the tongs. Simmer the Tomato Mint Soup for a minute more. Check for seasoning. Add more salt or pepper if necessary. Remove off heat. Serve Tomato Mint Soup hot. 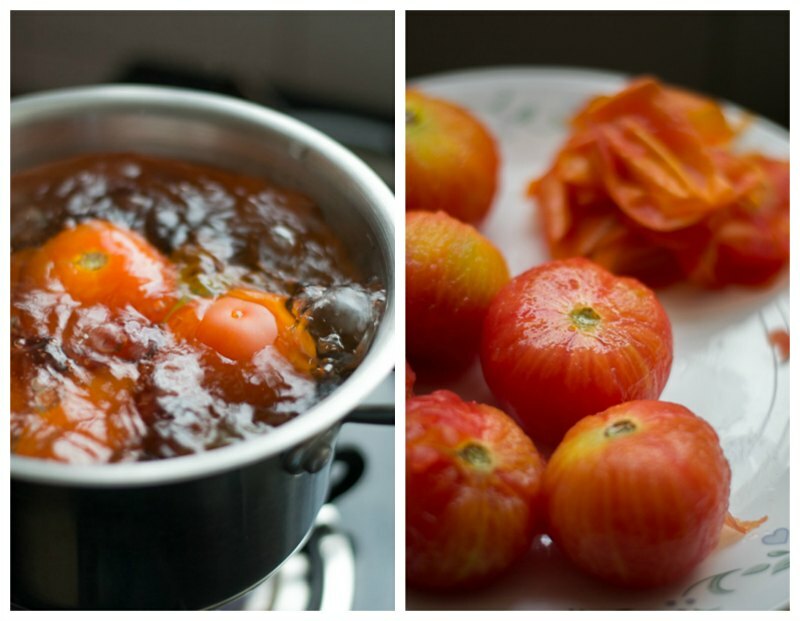 Boil water in a kettle and drop the tomatoes in boiling water. Let it boil for 5 minutes. Remove off heat. When cool enough to handle, peel the skin of the tomatoes. 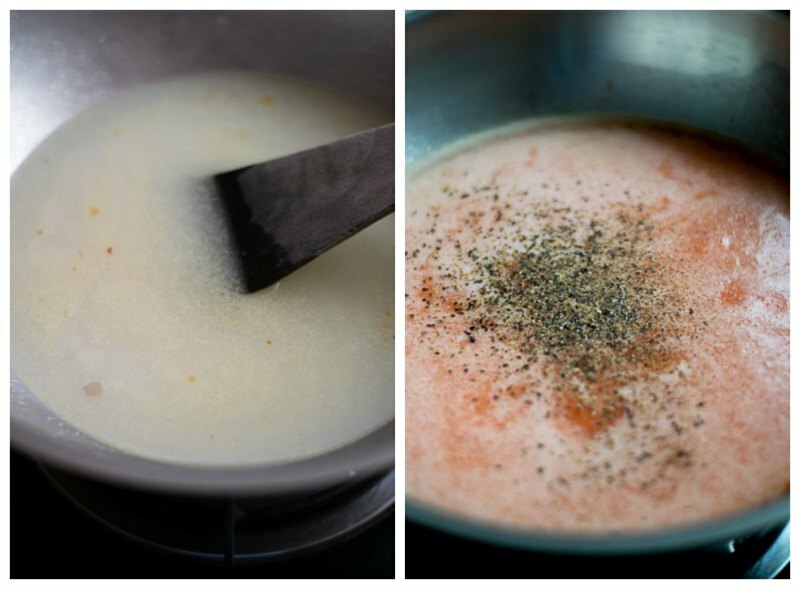 Run the peeled tomatoes in a blender to a puree. Strain the puree to get rid of the seeds. Set aside. Add in 1.5 cups of water and stir well. Add in the strained tomato puree. Add in the salt, pepper and a little sugar to taste. In the mean time take 15-18 mint stalks and tie it with a clean cotton thread. Add it to the soup and make sure the leaves are fully immersed. Let it boil for 10 minutes on medium flame. After 10 minutes, remove the mint stalks and try to squeeze all of the juices back on to the soup with the help of the tongs. Simmer the soup for a minute more. Check for seasoning. Add more salt or pepper if necessary. Remove off heat. Congratulations! Your blog post was featured in our Collective – Creative Mint Recipes To Stay Cool: Summer Special on March 31, 2016 at Blogadda. This soup sounds so wonderful and different at the same time! I am going to try this. I have lots of mint! I love home made tomato soup. This will be an interesting addition to my soup collection! !